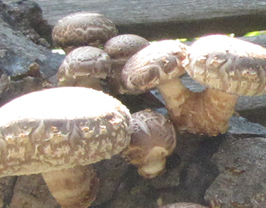 Native to Asia, shiitake mushrooms have been used medicinally by the Chinese for thousands of years. Current research shows that shiitakes stimulate the immune system, and contain compounds which have anti-tumor properties. With their rich, smoky flavor, shiitakes go perfectly in everything from appetizers and soups to entrées and side dishes. They are also excellent in pasta and stir-fry or marinated and grilled. Shiitakes dry well, and many recipes call for dried shiitake for its intensified flavor. Our shiitake mushrooms are grown from hardwood logs thinned from our woods using sustainable forestry methods. Dried shiitake mushrooms can be reconstituted by steeping them in warm water/broth for about 30 minutes or by adding them to a simmering liquid 10-15 minutes before serving. The flavorful soaking liquid can be strained and used where stock is called for. The texture and flavor of the fleshy shiitake mushroom cap is delicious, but its stem is fibrous and should be removed before cooking. 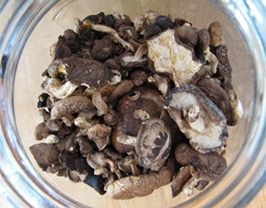 The stem is then commonly discarded, but can be finely minced before use, simmered to make a flavorful and aromatic mushroom stock, or be ground for use as a flavor enhancer. 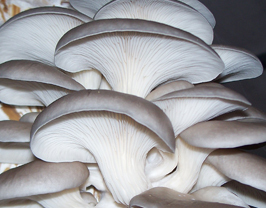 Oyster mushrooms are one of the most versatile mushrooms. They are easy to cultivate and common all over the world. They are also very beautiful, coming in a broad spectrum of colors. They have a nutty, subtle flavor that goes well in soups, stews, and sauces. Oysters are often used in stir-fried dishes, since the cap is thin and cooks quickly. Our oyster mushrooms are grown on poplar wood and on organic straw from Oechsner Farms in Newfield, NY. The Lion's Mane is a tooth fungus that grows on injured and fallen hardwood trees. It is common in the cool, moist forests of North America. It's one of the tastiest of the wild mushrooms, with a sweet and aromatic flavor that's often compared to lobster. 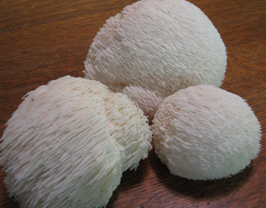 Use the Lion’s mane in soups, stews and any other dish that calls for mushrooms. Simply sautéing it brings out the sweet flavor best. Lion’s mane also freezes and dries well. Our Lions Mane mushrooms are grown on beech and oak and from blocks of organic hardwood sawdust. All ferns can be called Fiddleheads, but only the Ostrich fern is considered edible. In the spring (late April through May), the tender curled head of the fern is picked just after it makes its appearance out of the husk that houses the fronds. Fiddlehead ferns are a good source of vitamins A and C. Their flavor has been compared to a blend of asparagus, green bean and artichoke. Fiddleheads should not be served raw as they have a slight bitterness until cooked and may cause stomach upset if eaten raw in quantity. 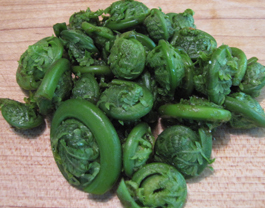 Our fiddleheads are wild-cultivated on the banks of our stream and sustainably harvested in season. 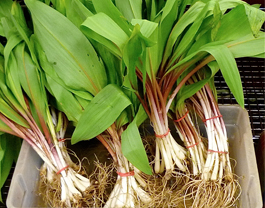 Ramps, also known as wild leeks, are native to the eastern North American mountains. They can be found growing in patches in rich, moist, deciduous forests and bottoms from as far north as Canada, west to Missouri and Minnesota, and south to North Carolina and Tennessee. In early spring, ramps send up smooth, broad, leaves that disappear by summer before the white flowers appear. The bulbs have the pleasant taste of sweet spring onions with a strong garlic-like aroma. Ramps add a wonderful and uniquely pungent flavor to soups, egg dishes, casseroles, and rice and potato dishes. Use them raw or cooked in any recipe calling for scallions or leeks, or cook them in a more traditional way, scrambled with eggs or fried with potatoes. Our leeks are wild-cultivated in patches around our farm. We use a rotational harvest system, picking only one patch each year and then re-seeding, which allows this early spring ephemeral to re-establish itself. © 2012 Double E Farms. All right reserved.